In the studio you can pick from many different creative activities, you can try one or a few its upto you, you can find us in Formby on Merseyside, we are a short drive from both Southport & Liverpool, for directions visit the contact us page. See below for a list of activities with prices. Here at China Butterfly in Formby we offer a wide choice of creative activities in a friendly environment, you can choose from many different craft activities, there is something for all ages from toddlers to grandparents, (see further down the page for craft activities list & prices). Our studio can seat upto 30 people & we have highchairs for our younger painters. For current studio opening hours please visit the contact us page on the website. You can either book in advance by calling the studio on 01704 831709 or even call up on the day to check last minute availability, we hope to see you soon! Remember craft activities aren't just for children! 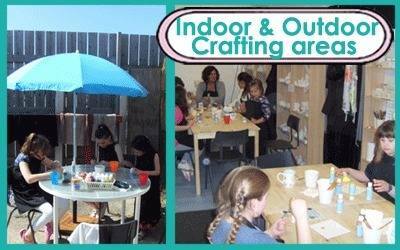 we have a large selection of items which are suitable for people of all ages, pictured on the right is a selection of activities perfect for adults or teens who want to try a creative activity, no experience is necessary and you don't need to be artistic as all our projects are really easy! You might be surprised at just what you can create & how relaxing it is. Perfect for mums who want to escape for a few hours and catch up with friends in a creative environment. Why not make a special Birthday or Christmas present for someone, our friendly staff are always on hand to offer help and guidance whenever you need it so don't be afraid to come and see what you can make! You can choose to do either one activity, or try your hand at a few, most activities don't need booking in advance with the exception of clay and potters wheel activities as we need additional staff for these activities so they must be pre booked. If you want to avoid disappointment we recommend calling us on 01704 831709 to reserve a table as we can get busy at weekends and during school holidays, if you reserve a table we just need to know numbers you can choose your activities once you arrive (excludes clay activities which must be booked separately) see below for full activities list and prices. Pottery painting with Acrylic paints From £8 to paint a small animal, bear etc, there is a whole shelf at this price, pieces go upto £20+ for the very large items. Acrylic paints dry to a matt finish & can be taken away with you on the day, not suitable for plates, vases etc. We have 100's of pieces to choose from. Pottery painting with Glaze paints From £8 to paint a small animal, bear etc there are 5 whole shelves at this price, pieces go upto £30+ for very large items, Mugs & plates from £12. Glazed pieces need to be left with us to be fired and collected about 1-2 weeks later depending on how busy we are in studio. Paint a wooden shape, we have a large selection of wooden shapes for you to choose from upto around £16 for the very largest pieces. The paints dry quite quickly & you can take your piece away with you on the day. Decopatch, choose your blank (from £8.50) pick your papers (25p per small sheet) then get ripping and sticking to create your artwork, this dries quickly and is to be taken away with you on the day. Foam Clay, choose your blank to decorate (from £5) choose your foam clay pack (£6.50 for 6 colours) get creative and make a fab textured artwork to take home today! Jewellery making, not currently available but hopefully returning to the studio soon! 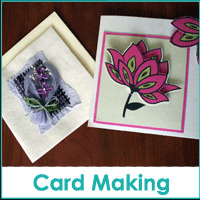 Card making, not currently available but hopefully returning to the studio soon. Mosaics kits £22.50, these are quite large mosaic pieces made using glass tiles on a sturdy wooden shape. These take around 2hrs to complete and are suitable for a wide range of ages. Make & take away on the same day. Potters wheel £20pp, Potters wheel sessions must be booked in advance so we can have the appropriate staff members in to help, sessions are for a minimum of 2 people at £20 each & must be paid for in advance as we have had people booking & not turning up. Please click on the pic on the right for Info. Handbuilding with clay £20pp Clay session must be booked in advance so we can have the appropriate staff members in to help, sessions are for a minimum of 2 people at £20 each & must be paid for in advance as we have had people booking and not turning up. Please click on the picture on the right for further info about clay activities.